Xerox Corp (NYSE: XRX), a global provider of print and digital document solutions like multi-function printers, and document technologies and services announced recently it has introduced what it says is a new generation of business transforming apps to its App Gallery. The Xerox App Gallery, which allows direct access to apps for your Xerox machines and printers, will now have a selection of apps specifically designed to add features and capabilities that streamline common business processes, resolve challenges, and improve the way you work. Now, your small business can download business apps from the Xerox App Gallery to do everything from scan and convert paper into necessary formats; translate documents via MFP or PC; and even share patient information securely with options like the healthcare app, Lisa says . “The Xerox App Gallery is accessible, easy to use, and rich in possibilities for businesses of every size and shape, from those who work on the go and leverage the Cloud, to those with traditional 9-5 offices who store their data in-house,” writes Lisa in a post on the Xerox blog announcing the business apps addition. Xerox Connect App for Salesforce: Lets you access Salesforce’s Customer Relationship Management system right at the device; upload and share sales management information to client folders by scanning the documents directly into Salesforce. Xerox Audio Documents App: Lets you securely transform hardcopy documents into audio files allowing commuters, multitaskers, or audio enthusiasts to listen on the go instead of reading. Xerox Connect App for QuickBooks Online: Offers you a hassle-free expense reimbursement process with multi-receipt scanning. Receipt data is extracted into an expense report and submitted with notifications sent to reviewers for timely approval. For Concur users, a similar receipt management app will be available by year’s end. Xerox Quick Link App: Enables a fast start to printing without IT support. This intuitive app sends an email directly from the device containing appropriate links to install and connects computers or mobile devices with the drivers and configuration settings. Small business owners know that technology can streamline business operations and facilitate faster growth. 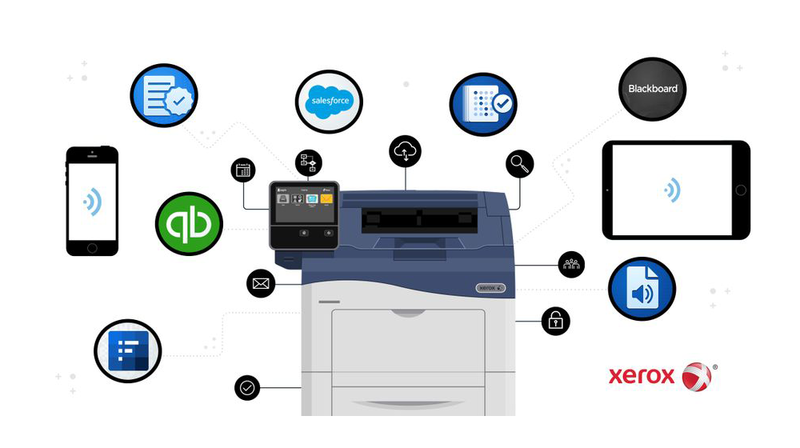 This latest enhancement to the Xerox App Gallery, adding apps that integrate Xerox’s multi-function machines and printers with popular platforms like Salesforce and Quickbooks, might just be the missing piece that propels your growing small business to even greater success. “As your business grows, the Xerox App Gallery allows your Xerox ConnectKey Technology-enabled devices to grow right along with you,” Lisa adds.